In large bowl, mix chopped eggs, mayonnaise, celery, salt and chiles. Place avocado in medium bowl; sprinkle with lime juice. Add onion; mash with spoon. Spread 1/4 cup avocado mixture on each tortilla to within 1/2 inch of edge. Spread each with about 1/3 cup egg salad mixture. Sprinkle cilantro leaves over each. Fold in sides of each tortilla; roll up. 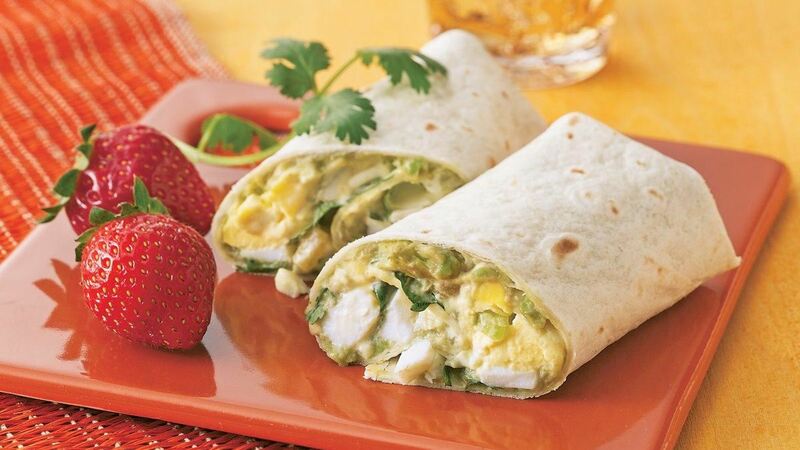 Arrange wraps on large serving platter; garnish with cilantro sprigs and strawberries.